PARLIER, CA (KMJ) – Gov. Gavin Newsom signs his first bill as governor on Wednesday, to provide immediate water supplies to parts of the Central Valley. 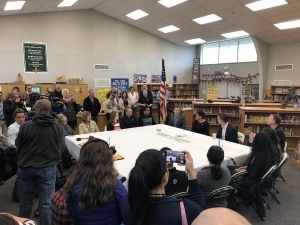 The Governor was joined by Democratic Senator Melissa Hurtado from District 14, at a press event at Riverview Elementary school in Parlier to sign SB 72, a bill providing safe access to water. “The appropriation is for $131.3 million dollars, and it’s part of a package that included more money to address the immediate needs for safe drinking water and that’s bottled water and emergency supplies,” said Gov. Newsom. He told media that he chose the school to make a point that there are “water bottles and not water fountains” because the water is unsafe to drink. Newsom said both sides of the aisle supported SB 72, a package to provide millions for water bottles and eventually a safe water system. 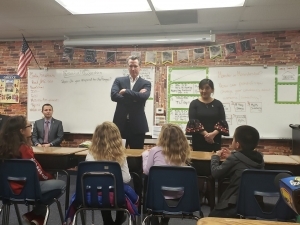 Before he put pen to paper, the Governor playfully chatted with students, asking them if they knew what a bill was. 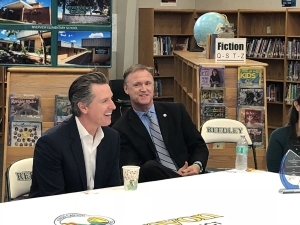 The Governor then held a round table discussion with teachers from the Kings Canyon District. Th Governor spoke about his commitment to finish the High Speed Rail that had been pushed by his predecessor Gov. Jerry Brown. 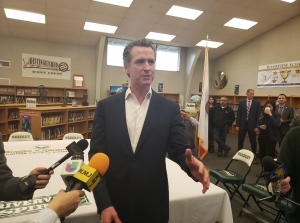 Newsom’s goal is to finish the rail between Merced and Bakersfield, saying its a real investment for the Central Valley, that has been under-resourced in terms of time and focus. Next up for the new governor, a meeting with mayors of Fresno, Bakersfield and Merced, continuing on his promise and his State of the State address to unlock the economic potential of the Central Valley. 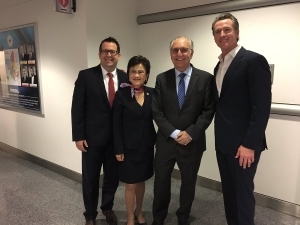 Lee Brand on Twitter: I appreciate Governor Newsom visiting Fresno today and meeting with three Republican mayors, Mayor Murphy of Merced and Mayor Goh of Bakersfield to discuss many of the issues of importance in the Central Valley. 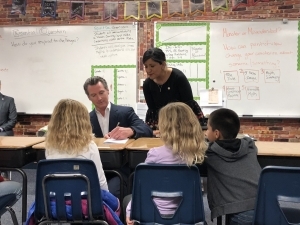 Newsom plans to later sign the second bill SB 73, to help communities that were impacted by wildfires to rebuild. He will visit Paradise, CA on Thursday, where the deadly Camp Fire devastated the town and its residents.